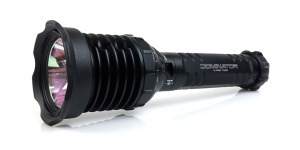 The new Surefire EB1 Backup® LED Flashlight has been eagerly awaited since its announcement as a replacement for the venerable E1B. It was a forgone conclusion that I would be buying one of the EB1’s just as soon as I could get my hands on it. The subject for this review is the black “clicky” version of the EB1, the EB1C-A-BK. 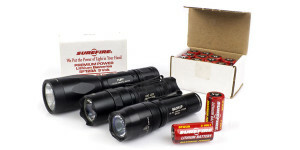 It comes packaged in the same red outer retail box and inner black box that has become customary for Surefire lights. There are no surprises in the box, just a light (with the single CR123a battery already installed), the warranty registration card, brief instruction manual and a Surefire decal. The packaging clearly identifies which type of switch is provided, as well as the rated outputs of 200 lumens on high (1.3 hours) and 5 lumens on low (40 hours). The packaging also indicates the other colors that are available – silver and tan – apparently with all of them being mil-spec anodized. 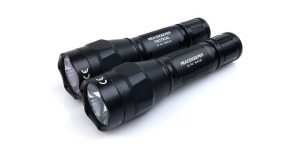 The light itself measures in at 4.5″ in length which is about 1/2″ longer than the E1B it replaces. This extra length comes from both the head and tail which are each slightly longer than their counterparts on the E1B. The EB1 is compatible with other E-series heads but the tailcaps are not interchangeable. The head on the EB1 is distinctive, not just for its increased length, but also for its larger diameter, which at approximately 1 1/8″ is slightly wider than the E1B head at its widest point. The head is essentially the same diameter from front to back and no longer has the contours found on the older E1B. Also, in a departure from previous E-series LED’s a spring is used for the positive contact on the head. The tailcap on the clicky version has a large shroud which would seem to be effective at preventing accidental activation. I have large thumbs but have no trouble reaching or activating the switch. The inside of the switch looks like a miniature version of the UB3T/M3LT tailcap and is notable due to its increased depth and much longer spring. I suspect this extra depth was added to accommodate the momentary tactical version of the switch. The light will tail stand, albeit somewhat wobbly, but it does not appear this was a design consideration. The button protrudes maybe 1/16″ beyond the shroud. The 2-way pocket clip is slightly longer than its counterpart on the E1B and adds a hole in the upper bend which could be used to attach a lanyard. 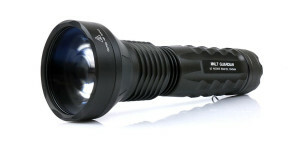 The business end of the light obviously uses an optic but it is different in appearance to the previous generation E1B, LX2, or E2DL. It is difficult to tell from the photo but it almost appears as if the back side of the optic is coated with a reflective material. Also, the “bubble” over the emitter appears to be considerably smaller. (Note: the three bright spots unevenly spaced around the optic are reflections from another light I was using in an attempt to illuminate the optic). Fit and finish are superb as expected from Surefire lights. Anodizing is flawless and all lettering is crisp and clear. The body feels solid and there is no slop or grittiness in the threads when attaching or removing the head and tail. The interface of the EB1C is the same as the E1B it replaces. 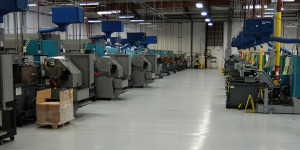 A light press on the button provides momentary activation while a full press (click) activates the constant on mode. The EB1 always turns on in high mode first with the low mode accessed by returning to off and pressing, or clicking, the button again within 2 seconds. My initial impressions of the beam are as expected for a TIR equipped light. It has a very bright spot, small amount of spill, and some rings around the outer portions of the beam. There may be some degree of green tint to the beam but at full brightness it has not been noticeable to me on fresh batteries. The greenish tint does become noticeable as the batteries become depleted or when the EB1 is used on low level. Runtime tests were performed with new Surefire CR123a’s from the same retail box and all batteries tested prior to use. A home made light box was used along with an Extech 401021 light meter and datalogging multimeter connected to a computer. 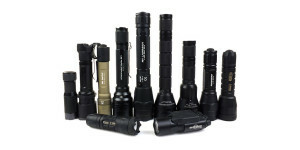 The charts below show the relative outputs of a variety of Surefire TIR equipped lights with the 100% value being equal to the E1B’s output after 30 seconds. First up, the EB1 is compared to a 110 lumen (rated) E1B and a 65 lumen (rated) L1 Lumamax. The EB1 and E1B curves intersect right around the 50 minute mark. The EB1 then reaches its 50% point shortly thereafter at 52 minutes and then reaches the 10% mark at 86 minutes. This chart also gives an indication of just how much Surefire underrated the output of later generation L1’s. If the output of the other lights is any indication, the EB1 seems to put out a solid 200 lumens. Of the four lights it actually had the highest initial output before settling down to a more middle of the road level for the next 10 or so minutes. These charts illustrate how the EB1, on a single CR123a, is unable to maintain the same level of regulation as comparable lights with lower output or more cells. However, when used in its defined role, as a backup to a primary light, this is a non-issue. In the following photos, the beam of the EB1 is compared to a selection of other lights at different distances. The beams can be compared across the full width of the image using the slider, while additional images can be accessed by using the navigation buttons in the bottom-right corner. In practice, the EB1 is very easy to use and carry. The two-way pocket clip securely holds the EB1 and allows for bezel up or down carry according to the user’s preference. The smooth design of the body prevents the light from hanging on clothing while the clip and shrouded tail cap provide for a secure hold when in use. Overall there is a lot to be excited about with the EB1. For its size it provides unmatched beam intensity enabling it to reach considerably farther than even some much larger lights. Although it felt strange in my hand at first, when compared to my old E1B, it now feels natural and actually fits my hand better than its predecessor. To see how the EB1 performs with the F04-A Diffuser, F05-A Red Filter, or F06-A Blue filter, see the Mini-Review of the new SureFire Diffuser and Filters. Additional information can be found on Surefire’s website. One year after acquisition of my EB1(-T), this light always remains a “safe bet”, I’m going again use him this summer for my night rides. I have lusted after the EB1 for awhile but sadly I have bought a second E1B as a spare just a few months before the new light came out. I also just ordered an Elzetta Alpha so it’s kind of hard to justify a fourth $150+ flashlight right now.